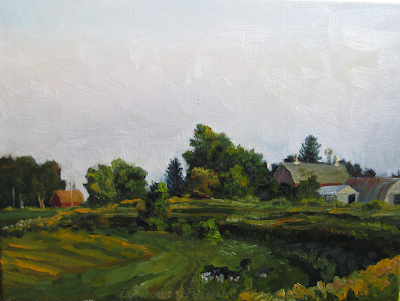 Old Neighbors, 9 x 12" plein air, oil on linen. Last night's painting was pretty last minute, and I only had about an hour and a half, if that, before the light was gone and I had to pack up. Perhaps I should have chosen something a little simpler, but I just love this view of these two neighboring barns and all the great old trees overgrowing the landscape. It turned out kind of rough, but I had a good time, and a perfect spot for seeing a beautiful hazy sunset and spectacular moonrise simultaneously.